At the pinnacle of a dizzying career, Indian-American rapper Nimesh “Nimo” Patel was haunted by an unshakeable sense of emptiness. In his mid-twenties, he abandoned the limelight and found himself meditating in the foothills of the Himalayas. There, an inner voice nudged him to radically simplify his life and find his purpose in service to others. He moved to the Gandhi Ashram in India and dedicated himself to the children in the surrounding slums. Fast-forward to April 2012: Nimo and a dance troupe of sixteen of "his kids" toured the world with "Ekatva" – a performance whose ultimate message was Oneness. A year later, in the summer of 2013, seven years into his musical hiatus, something inside nudged Nimo to begin writing music again, but this time in a different spirit. This time, the music would capture the heart of humanity. 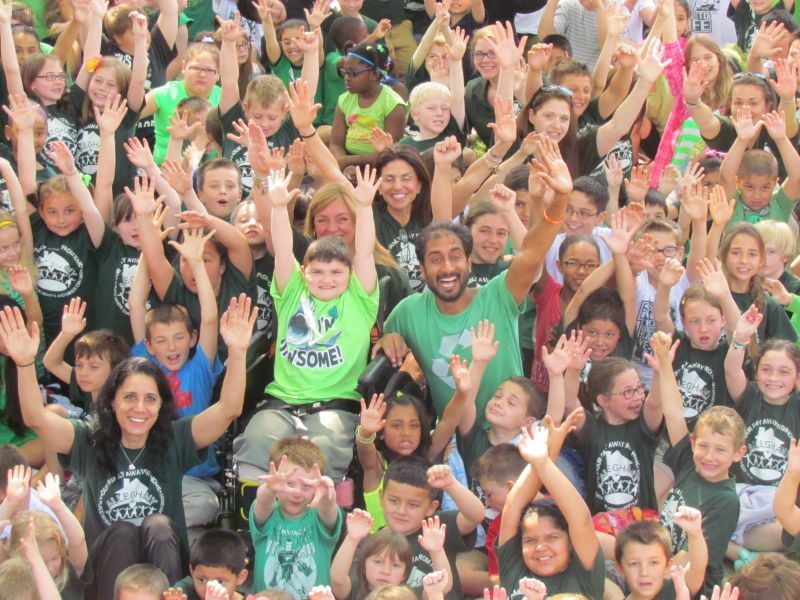 A few months after he began writing, inspired by a global 21-Day Kindness Challenge, Nimo wrote and produced Being Kind. Together with a labor-of-love crew of volunteers, he co-created a zero-budget music video in one week as an offering of gratitude for the 5.9K participants across 98 countries who simultaneously committed to doing a unique act of kindness every day for 21 days in the spirit of “being the change” they wish to see in the world. A month and a half later, he did it again with Grateful, a musical offering inspired by the 11.5K participants and their small acts throughout the 21-Day Gratitude Challenge. In the tailwinds of these heart-opening productions, Nimo has most recently embarked on a pilgrimage to bridge music, love and selfless service, through Empty Hands Music. Over the last year, he has produced a new genre of hip-hop that ignites the values of kindness, gratitude, service, love, and joy. In May 2014, the Empty Hands album was released as a 100% labor-of-love gift, downloadable at no cost for all who wish to listen to it. The immediate response from many after listening to the album has been: “I have been listening to your album on repeat for the last week and I can’t stop. It brings tears of joy to my heart every time I listen. Thank you!”. 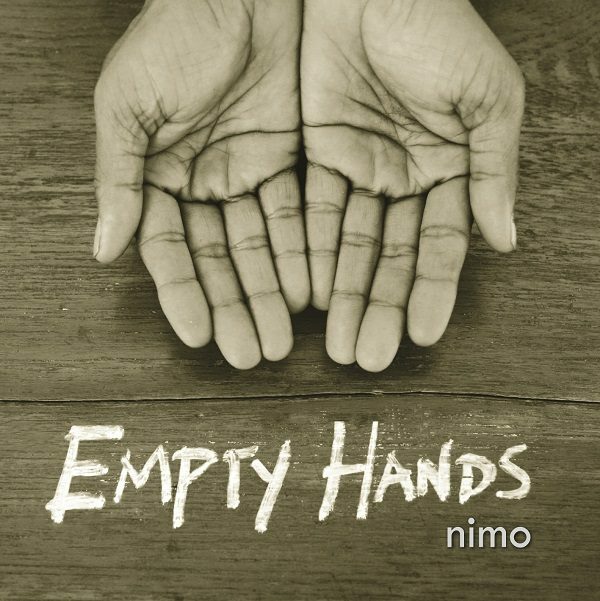 The 2014 Empty Hands Music Tour, that Nimo is currently on, is a 7-month pilgrimage across the US and UK to share and engage communities along the way in the themes embedded in his music. The intention is not so much to perform, but rather, to plant seeds of goodness and connect hearts in the spirit of service. From school assemblies to universities, churches and temples to living room circles and convention keynotes, the intention is to hold space for audiences of all shapes and sizes. At each event a few local folks are invited to share stories related to the themes of Nimo's songs. The focus is not so much on 'staging a show' as it is about tapping into the individually unique interpretation of these universal values. Small stories and ripples are captured and shared on the Empty Hands Facebook page, so the inspiration can be shared with the wider community. Already, in the first few months of the pilgrimage, the public resonance with this quality and spirit of music and intention is palpable. The entire tour has been self-organized by community members who reached out from all over the globe --including Ireland, Nashville, Bombay and London. The intention of this tour from the start has been, not to merely entertain, but to deeply serve. And that intention has shifted individuals, communities and leaders from all walks of life. Grateful has now garnered close to 300K views and Being Kind close to 90K views on KarmaTube.org. The sharing of Nimo's special journey from “Solving to Service to Surrender” has been documented in a TEDx Talk in Bangalore. But beyond these surface milestones, the stories and ripples below the surface are what make up the essence of the Empty Hands Music Pilgrimage. With no agenda, expectation, or strings attached, the tour is a vehicle for the emergence of compassion and generosity in our own unique ways. Nimo never asks for compensation nor expects a set outcome, even for his physical album which he gifts to every person that attends his events. With that depth of intention, people are drawn to come and participate from a space of authenticity, curiosity, and openness. In so doing, they often find themselves invigorated by the rediscovery of our interconnectedness, and inspired to practice small acts of kindness, gratitude and beauty in their own daily lives. As 14-year-old Priyanka puts it, “We are so, so busy behind getting money, behind getting power, that we forget why we are here. 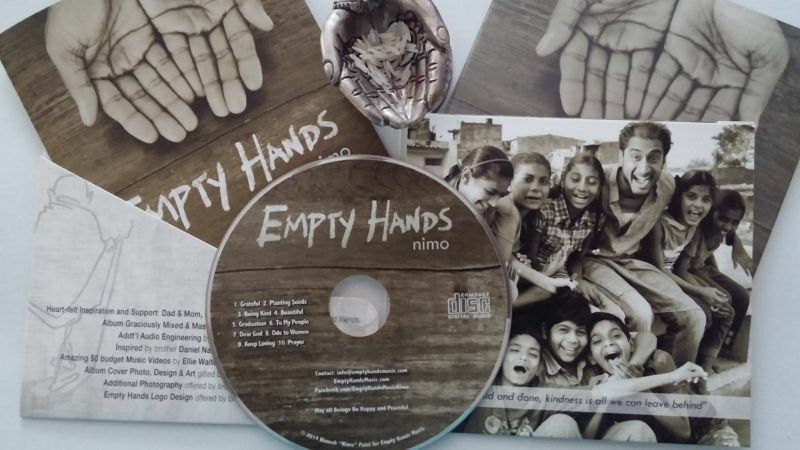 But that joy of spreading kindness, of spreading gratitude, is something that we will keep in our mind and heart until the time we die.” Priyanka from Pune, India came across Nimo and Empty Hands music last fall and was truly inspired. Since that encounter she has embarked on her own magnificent kindness journey. Raised by a single mother in humble surroundings with modest material means, she walks up to Nimo one day and handed him a jar of money she had saved. Nimo refused it several times, until she finally explained, “You take it and do something kind for someone else with it.” The next day she offered her most prized possession, her childhood teddy bear “Nia”, to an old lady at a hospice that she was trying to comfort. Later in the weak she calls Nimo and shares that, her mind was scared to give away her Teddy bear, but that she was happy she followed her heart. 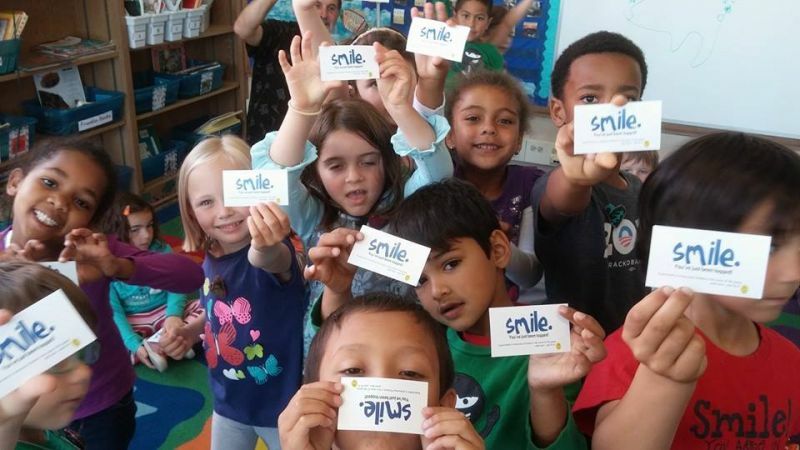 In early May, Priyanka skyped in all the way from India to an Empty Hands gathering in Los Angeles, CA and shared a powerful story about kindness to an audience of 75 people via a TV Screen. Throughout the tour, many stories like these— of ordinary people in extraordinary moments— are captured, shared, and ultimately self-organized into a resilient web of people moved to connect and collaborate in a real, down-to-earth regeneration of the human potential for goodness. The Empty Hands Music Pilgrimage is a journey that weaves together pockets of people and communities across the globe to celebrate the human spirit-- to inspire a renaissance of daily life through micro-moments of love, and to realize our own potential to change ourselves, and in so doing, to change the world. As Mother Theresa shared, “We can do no great things, only small things with great love”. This has been the spirit of the Empty Hands Pilgrimage. Over the next five months, Nimo will continue to practice micro-moments of love through story, song, and everyday acts across the US and UK. You may like to catch updates on Facebook, listen to his songs, download the album, and share the love, the message and joy. A full schedule of the Empty Hands tour can be viewed here.